So yesterday Julia mentioned that the future showrunner of Doctor Who has been selected – Chris Chibnall, of Broadchurch fame. This meant that the vague rumblings I’d heard about Steven Moffat being out were true, or at least at some point true – so I ran to the Internet to find out more. Have a link! It seems Moffat will complete his run with Series 10, which will indeed air Spring 2017, as feared. I had called this one of the things I was excited for this year – especially getting a new companion, since Clara was ever ill-used. Looks like I am losing this to next year, making comic-book-related media an even larger part of my year. And since it sounds like Series 10 has not been written yet, there’s nothing on the new companion for now – nor about whether Peter Capaldi’s contract, which only goes through this coming season, will be renewed or not. What do you think about these Doctor Who rumors and plans? Happy to see Moffat go? Scared of what will happen with the Doctor and his companion? Trying to imagine Doctor Who in the style of Broadchurch? Let us know what you think in the comments below! Doctor Who Series 9 finished a few weeks ago and so in anticipation of the Christmas Special, “The Husbands of River Song,” I thought I would discuss my feelings on Series 9. I have really loved Capaldi as the Doctor, but Clara has been a particular disappointment so the past couple of series have been… interesting. I was not sure how 9 would go because originally it was rumored that Clara was supposed to leave during the last Christmas Special and then suddenly she didn’t. There have been a lot of things that I have enjoyed about this season because they have played a lot with the concepts of war and death. Most of it is really well done, but they kept having Clara almost die, which was a bit overdone. The overall stories have been really well done, but Clara has felt like an obligatory companion and not as the amazing character she could have been. How the Heck is Clara Not Dead Yet? We’ve been enjoying this season of Doctor Who so far, but the first thing that very clearly dawned on us – after we hit the “To be continued” at the end of the first episode and looked up the rest of the season… it’s going to be a season of two-parters. Which in-and-of itself is fascinating, and potentially a good idea. There have been plenty of episodes that would have been better with more time, although also some two-parters that could potentially have pulled off one episode. So it’s a mix. They spent last season trying to reinvent Clara, make her into the teacher. It didn’t work, really. But in the 50th Anniversary Special, there was also the whole thing about Clara working with Unit – and how they kept erasing her memory of that. Apparently, it stopped being erased, and there have been some Unit moments this season as well. So now I guess she’s the action heroine? I don’t know. But she’s almost died multiple times, and with a title like “The Girl Who Died,” you know, I thought maybe it finally happened. But no. I’m hearing rumors again that this Christmas will see Clara go, or the end of this season, but… she keeps not dying. It almost sounded like it’s becoming a thing with the Doctor… time will tell. On the most recent two part episode of Doctor Who there was an interesting choice to make one of the characters deaf. In the episodes “Under the Lake” and “Before the Flood” the second in command is a woman who happens to be deaf. It got me thinking about the overall conversation about diversity in television. When we talk about diversity in television it has to be diversity across all ranges. It cannot just be about race or gender, it should be about the wide range of diversity that we find in the human race. Of all the shows that could pull off and highlight true diversity, Doctor Who is a show that is not bound by the rules of our current society because it can dream about what could be instead of what is. Part of what is great about what Doctor Who did by having a woman who is second in command and happens to be deaf is that they make it no big deal. 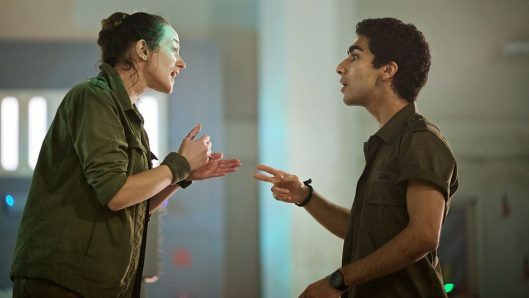 She is just one of the crew and while she needs to have an interpreter to help her communicate, it does not mean that she is any less capable than anyone else. They even use the fact that as someone who cannot hear she has developed the ability to read lips, which comes in quite handy during the episode. It sometimes feels like someone who communicates differently would not be seen as someone who is just as capable and could have been used as the joke or the one that has to be propped up – or killed off. Instead of just another person along for the ride. The particularly creepy, scary ride. I think a lot of times that shows and other media show people who are different as somehow less. Particularly I think that often people who have some type of disability are often used as sob stories or something that needs to be corrected for. I think this is changing, but it is still always good to see when we re-imagine how we see people who are different than us. When most of television seems to be done by white males it is good to see that they can potentially respect the imagining of people who are different than them as people and not just side notes or emotional resonance. It is great to see increased diversity in shows that I watch, but there is so much more that can be done. This is one example of something really good, but wouldn’t it be great if the character of the Doctor himself showed something a little different? So far he has been a white man and while yes it is nice for them to go back to an older Doctor, there are definitely some great ideas for doing someone of color or to even have a female Doctor. Now this is just talking about one show, but this is true for a lot of shows. Now this is not to say that we should force things into certain situations for diversity’s sake, but maybe we could rethink the story being told to think about how someone else might fit into that situation. We live in a big, colorful world, full of all types of people. Shouldn’t the shows reflect that?